Premium video content for our Spaceflight Now Plus subscribers. New panoramas from NASA's long-lasting Mars Exploration Rovers show the view from the Columbia Hills where Spirit continues its adventure and the strange landscape at Meridiani Planum where Opportunity is driving southward. Scientists marvel at the achievements made by the orbiting Hubble Space Telescope in this produced movie looking at the crown jewel observatory that has served as our window on the universe. 10 years ago: The Solar and Heliospheric Observatory, a joint European and American Sun-watching probe, blasts off from Cape Canaveral aboard a Lockheed Martin Atlas 2AS rocket. The European Space Agency's Huygens probe, launched from NASA's Cassini spacecraft, descended through the atmosphere of Saturn's moon Titan and landed on its mysterious surface in January. Scientists hold this news briefing to report on new results from the daring mission. Project scientists working on the European Space Agency's Mars Express spacecraft now orbiting the Red Planet hold a news conference to announce some interesting results from the ongoing mission. Mercury astronaut John Glenn becomes the first American to orbit the Earth on February 20, 1962, when he is launched aboard Friendship 7.
International Space Station commander Bill McArthur and flight engineer Valery Tokarev mark the Thanksgiving holiday in orbit during this downlinked message. Expedition 12 Soyuz commander Valery Tokarev and station commander Bill McArthur temporarily leave the International Space Station. They undocked their Soyuz capsule from the Pirs module and then redocked the craft to the nearby Zarya module. The move clears Pirs for use as the airlock for an upcoming Russian-based spacewalk. Check out NASA's Pluto-bound New Horizons spacecraft undergoing thermal blanket installation inside the cleanroom at Kennedy Space Center's Payload Hazardous Servicing Facility in preparation for launch in January from the Cape. A new image from NASA's Spitzer Space Telescope reveals billowing mountains of dust ablaze with the fires of stellar youth. The majestic infrared view from Spitzer resembles the iconic "Pillars of Creation" picture taken of the Eagle Nebula in visible light by NASA's Hubble Space Telescope. Astronomers using ESA's XMM-Newton observatory have found very hot gaseous halos around a multitude of spiral galaxies similar to our Milky Way galaxy. These 'ghost-like' veils have been suspected for decades but remained elusive until now. Galaxy 'haloes' are often seen in so-called 'starburst' galaxies, the locations of concentrated star formation, but the discovery of high-temperature haloes around non-starburst spiral galaxies opens the door to new types of measurements once only dreamed about. For example, scientists can confirm models of galaxy evolution and infer the star-formation rate in galaxies like our own by 'calculating backwards' to estimate how many supernovae are needed to make the observed haloes. "Most of these ghost-like haloes have never been confirmed before in X-ray energies because they are so tenuous and have a low-surface brightness," said Ralph Tullmann, from the Ruhr University in Bochum, Germany, lead author of the results. "We needed the high sensitivity and large light-collecting area of the XMM-Newton satellite to uncover these haloes." In starburst galaxies, which have prominent haloes, star formation and star death (supernovae) are concentrated in the core of the galaxy and occur during a short time period over the life of a galaxy. This intense activity forms a halo of gas around the entire galaxy, similar to a volcano sending out a plume. So how can haloes form in the absence of intense star formation? 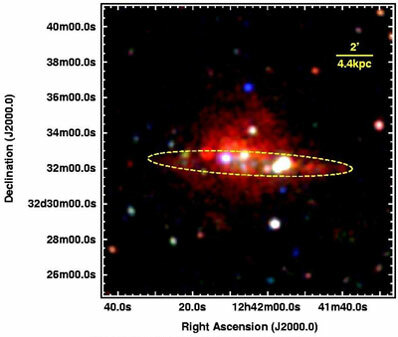 Tullmann's group say that the entire disk of a spiral galaxy can 'simmer' with star-formation activity. This is spread out over time and distance. Like a giant pot of boiling water, the steady activity of star formation over millions and millions of years percolates outward to form the galaxy halo. Two of the best-studied galaxies so far out of a group of 32 are NGC 891 and NGC 4634, which are tens of millions of light years away in the constellations Andromeda and Coma Berenices, respectively. The scientists noted that these observations do not support a recent model of galaxy halo formation, in which gas from the intergalactic medium rains down on the galaxy and forms the halo. Galaxy halos contain about 10 million solar masses of gas. The scientists say it is a relatively straightforward calculation to determine how many supernovae are needed to create the halo. Supernovae are intricately tied to the rate of star formation in a given galaxy. "With our data we will be able to establish for the first time a critical rate of star formation that needs to be exceeded in order to create such haloes," said Dr Ralf-Jurgen Dettmar, a co-author also from Ruhr University. Once these haloes have formed, the hot gas cools and can fall down onto the galaxy's disk, the scientists said. The gas is involved in a new cycle of star formation, because pressure from this infalling gas triggers the collapse of gas clouds into new stars. Some heavy elements might escape the halo into intergalactic space, depending on the energy of the supernovae. Further analysis of the chemical composition of the halo might reveal this. This would determine the correctness of recent cosmological models on the evolution of galaxies, as well as provide evidence of how the elements necessary for life are distributed through the Universe. A team led by Dr Ralph Tullmann of the Ruhr University in Bochum, Germany, discusses these results in two articles in the scientific journal Astronomy & Astrophysics. Tullmann's co-authors are Wolfgang Pietsch (Max Planck Institute for Extra-terrestrial Physics in Garching, Germany), Dieter Breitschwerdt (Institute for Astronomy, Vienna, Austria), and Joern Rossa (Space Telescope Science Institute, Baltimore, Maryland, USA).